Cinemax has seen both highs and lows on DSiWare — its Rytmik games have proven to be excellent composition tools, but games like Snakenoid, a bizarre mix of Snake and Arkanoid have missed the mark. 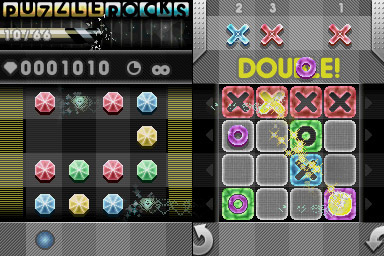 Puzzle Rocks is a puzzle game, but we're not quite sure it's really similar to anything else, except maybe Connect Four. 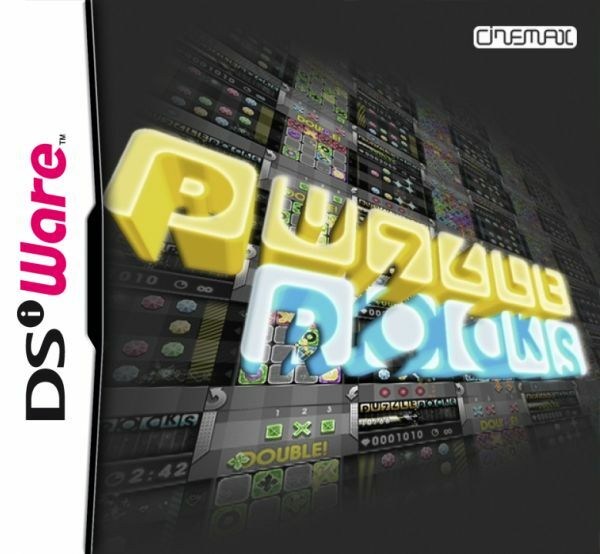 It's one of very few DSiWare games which are played while holding the system book-style, on its side, and you'll need to keep a constant eye on both screens. The right (bottom) screen is the most important one: you've got a grid with four rows of four blocks that have holes in them. Shapes matching these holes will appear above the top row, and will eventually begin to descend. Should they land in a matching hole, a jewel located at the same place on the other screen will either be destroyed or added (depending on if there is or isn't one in that spot already) with a certain colour. As you might have guessed, the way to score big is to get four jewels of the same colour in a row. Of course, if you just let the shapes on the right screen fall into the matching holes, you'll get some early stages done, but it won't do the trick for later ones, so you'll have to cleverly manipulate the blocks into falling into holes in the right spots. Thankfully, each row of holes can be moved left or right, with the stage wrapping around, so if a hole gets moved off the right side of the row it'll reappear back at the left, making it easier to change stuff around as you see fit. If a block passes a hole it does not fit in, it will not snap into place, but, if you move the row as the block is over it, the block will be moved together with it, allowing you to "drop it off" at a different column. However, this requires some major planning, and thankfully, the game allows for that, as it is also, surprisingly, turn-based. On each turn, you get to move one row left or right once, after which all the blocks will move down by one space. This means you can take your time to think each move through carefully, in an attempt to get the best possible score from jewel matches on the left. The game has 36 replayable levels, with a medal system for each one, so if you feel so inclined you can return to any previous level in an attempt to seize that gold medal that just eluded you last time. Graphically and musically it's the typical average fare. Not particularly good, not particularly bad, but it all gets the point across even if it is a bit bland. Puzzle Rocks is bit of a unique puzzler in that despite being sort of a falling block game, it's turn-based, which means you can take as long as you want plotting out your next move. It's not as gripping as a classic like Tetris, but it's a solid puzzler nonetheless, and worth a look if you're searching for another portable puzzle experience. really though thanks for that more info ..
Hope it comes to the US soon. I'll be picking it up day 1. I've been looking for a relaxing puzzle game for my DSi, and I hope this is it . 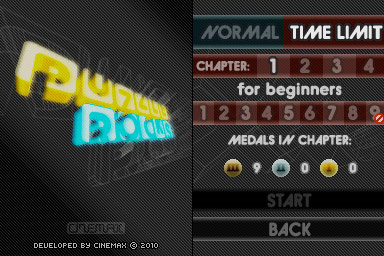 When I tried to complete Normal mode on the first level, the game does not end, even when all the blocks are used.